HomeKilkenny Blue LimestoneHow Stone?How Did It Form? 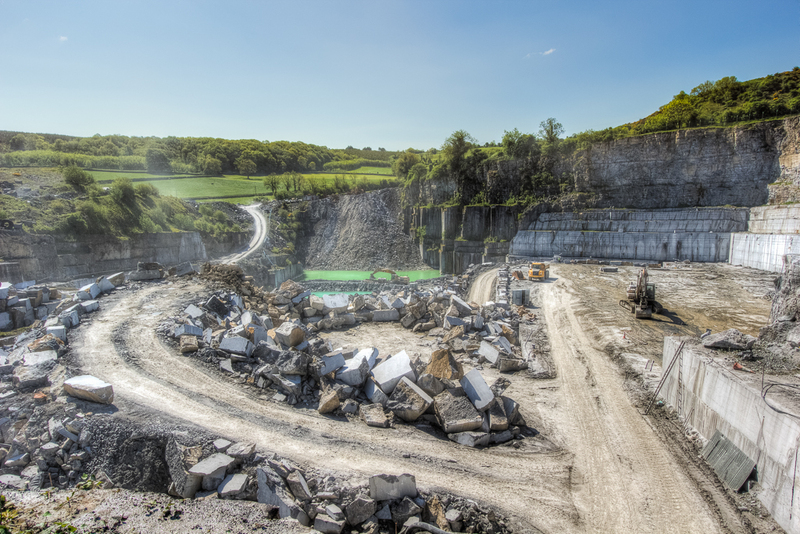 The Irish Blue Limestone story begins 370 million years ago. North America and Northern Europe were joined together in a single continent called Laurentia which straddled the equator. Gondwanaland, incorporating South America, Africa, Antarctica and Australia was centred on the South Pole. 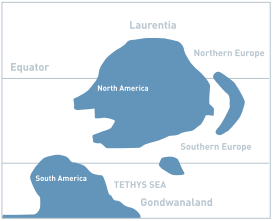 A slow anti-clockwise rotation of Laurentia during the 64 million years of the Carboniferous caused it to collide with and finally became part of Gondwanaland. what became Ireland. During the next 45 million years tectonic activity, associated with the continents colliding, caused changes in the depth of water and the position of the coastline. The inlet initially lay on the southern edge of the continent about 15 degrees south of the equator when the Irish Blue Limestone was deposited. The climate and conditions would have been similar to the modern day Carribean or Red Sea. The Wicklow Hills may have formed an island in this sea and the coast extended from Donegal through Northern Ireland into Louth and Longford. The conditions changed during the last 19 million years of the Carboniferous. By then Ireland lay just north of the Equator and sandstones, mudstones and thin coal seams superseded the limestone. Why was the Limestone deposited? Water draining into the sea from the land to the north carried dissolved calcium salts as well as small amounts of clay minerals and coarser sand grains. Much of the clay and sand would have been deposited near the coast, but mixing of the fresh water with the salt water of the inlet led to chemical reactions that created thick deposits of lime mud on the sea floor. Crinoids and corals grew in the shallower waters where the sunlight penetrated to the floor and brachiopods lived in the deeper parts. Reductions in sea level caused breaks in the deposition. Deepening of the water replaced the crinoids with brachiopods but subsequent decreases in depth allowed the crinoids to re-establish. How did the Limestone form? The relentless increase of sediment thickness caused the water to be squeezed out of the mud. Although some of the calcium carbonate went with it the remainder re-crystallised to form what we call the Irish Blue Limestone. Finely disseminated carbon present in the muddy deposits gives the distinctive colour. When large amounts of calcium carbonate dissolved, fine partings of clay minerals and carbon (stylolites) were left behind. The major stylolites simplify extraction of the blocks in the quarry. The deeper water deposits became fine grained darker limestones often with prominent white brachiopods. The shallower water deposits became the paler blue crystalline limestone with the crinoid stems. Occasionally coral colonies form distinctive masses in the limestone. The lithification masked most of the deposition breaks; often all that remains is a subtle colour or texture changes within a thicker limestone bed. Fissures in the hardening mud allowed some of the dissolved calcite to be deposited as white crystalline infill. These form the distinctive white lines that characterise some horizons in the Irish Blue Limestone. The interaction of environmental factors and lithification make every horizon in the quarry different. The skill of the Irish Blue Limestone producers is to match these subtle variations to the customer’s requirements so that the finest material is supplied for every project. Next: How is it produced?